If we were asked to select a motorcycle that typifies the new modern trend in two-wheel transportation, the Suzuki T10 250cc touring model would certainly be one of our top choices. Its a machine that is as up-to-date as a 1965 automobile, and probably better finished than many of its four-wheeled counterparts. 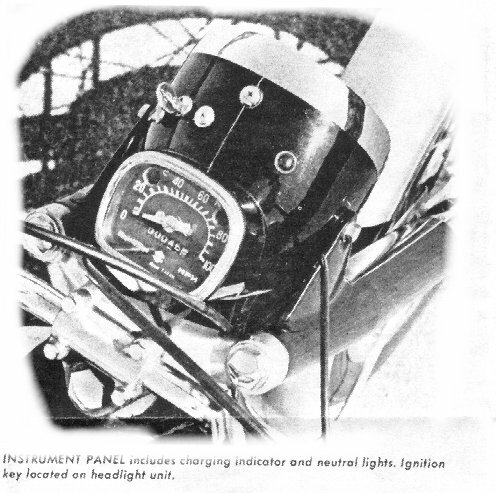 By modern we are referring to such luxuries as an alternator indicator light located in the speedometer unit that glows when the battery is not being sufficiently charged, a neutral indicating light, and the smoothest electric starting system we have used. 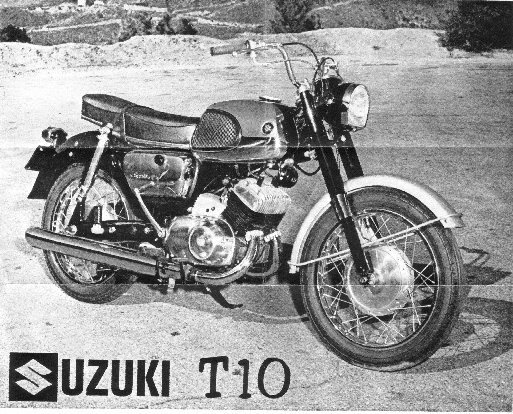 If automatic transmissions were desirable on motorcycles, the Suzuki 250cc T10 would be a natural bike to have one, one rider was heard to remark. 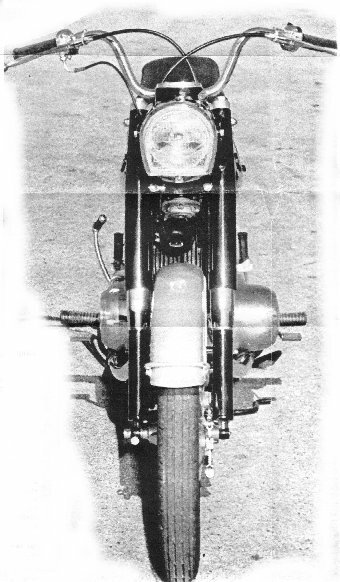 He was, of course, implying that the cycle is smoothly and effortlessly operated and that shifting gears was about the only feature that reminded him he was riding a motorcycle! Th TlO even comes equipped with a fuel gauge . . (a clear plastic indicator tube mounted at the front of the tank). Its fool proof and a welcome convenience. Another novel and practical Suzuki innovation is a handle located below the seat for the purpose of raising the bike on the center stand to park. Any rider who has ever snapped a seat strap while walking the machine onto the stand will appreciate this handle. These features may seem trivial to some readers, and certain enthusiasts will even scoff at such "nonsense". But it is our belief that the newcomers to the sport, the doctors, salesmen, lawyers, and housewives, want a two-wheeled version of the family auto-mobile rather than a stripped down stormer. Much the same situation exists in the sports car market, where the purist has been joined by the roll-up-window-automatic-transmission buyer. A look at todays ads will support this idea. At any rate there is no law that prevents a bike that is packed with convenience features from being a good performer. Suzuki is an extremely competition minded organizsation; and a successful one both financially and on the race track. As one of Japans big three, Suzuki has nearly dominated certain lightweight road racing classes for several years. Their racing knowledge is evident on production models such as our test model TlO. The most important recent refinement to this model has been the adoption of king-size double leading shoe, full hub width brakes. These units are not only an appearance asset to the machine, but are powerful enough to stop a bike twice the size of the 250cc Suzuki. 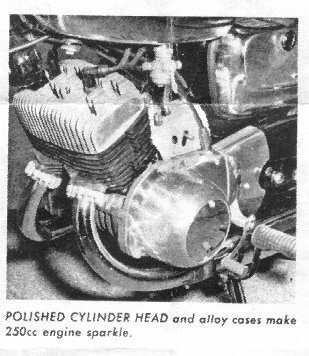 The twin-cylinder engine is equipped with a pair of carburetors. 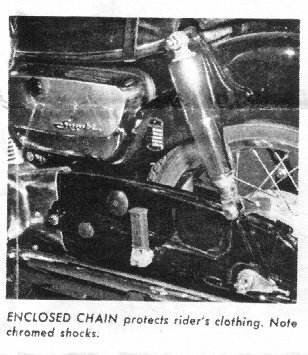 For cold weather starting the rider has at his disposal a dual choke operated by a single hand lever, and a tickler on each carburetor. We never needed the ticklers in our testing. The T10 fired up every time with a single touch of the button, using the choke. Once warm, the choke was not required and the T10 leaped into life instantly. It seamed to anticipate the riders desires! Two to three weeks of storage did not hamper quick starting. The 4-speed shift pattern is: neutral, down to first, second, third, and fourth. It is not a rotary shift type, so there is no possibility of hitting neutral after fourth gear. Downshifting must be enacted with the toe under the lever. There is no heel provision in the shift lever. The CYCLE staff sometimes finds it confusing when we are testing several makes with various shifting styles, but the Suzuki pattern is no problem after a couple hundred miles. The Suzuki TIO finish is excellent; Ample use of chrome and polished alloys add a real touch of richness. Colours available are black, red, white, and blue. 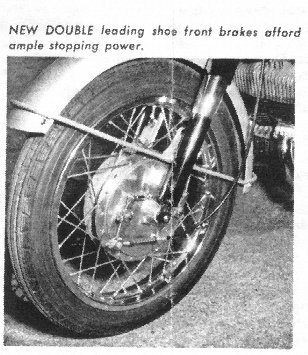 Also, we felt that folding foot pegs would be a welcome addition for the rider. The passenger pegs do fold. The T10 is definitely more of a touring bike than a sport model. We experimented with some twisty mountain roads and found the power to be ample and gear ratios fine, but leaning over considerably resulted in some low-hanging parts scraping slightly on the pavement. Overall handling characteristics are excellent, however, for the type of riding for which this mod is intended. Top speed is in the 79 to 84 mph bracket. 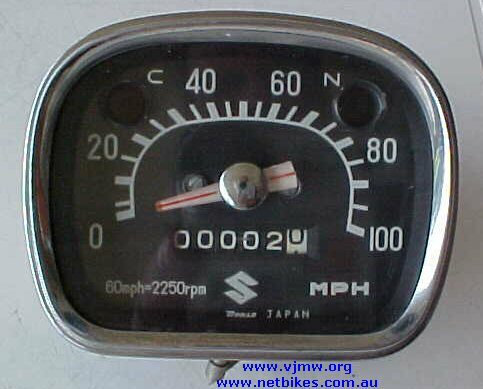 We also rode the Suzuki on one of the busy Los Angeles freeways. will certainly keep up with the traffic, although it does not afford the same sense of security that a larger machine offers. The bikes lighting system rates as superior to many machine we have tested. 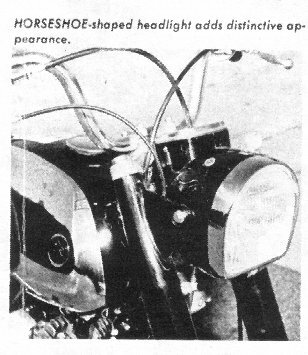 Located on the headlight is the unique four position ignition switch that also controls head and tail lamp as well as providing one place to lock the bike. 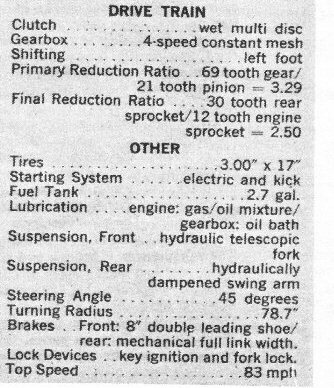 There is also a steering column lock. We feel that some other manufactures should give more attention to the foolproof devices. The Suzuki T10 finish is excellent. Ample use of chrome an polished alloys add a real touch of richness. SUMMARY: Suzuki, is a firm that believes in thoroughly developing each model before it is put on the market. For this reason, perhaps, one or two hoped-for models have not yet been introduced. 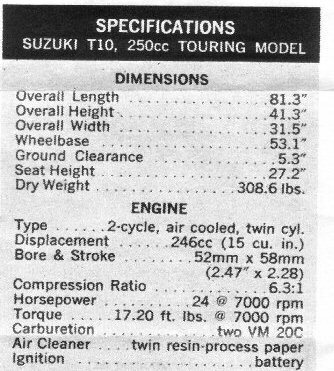 But if he T10 is an indication of the end result of such an exhaustive program, we are sure that future Suzuki models will be in great demand right from the start. Thanks to Joe Broussard for sending this test sheet across the globe.